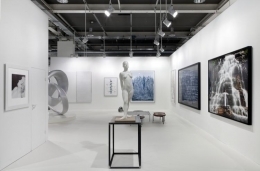 We look forward to seeing you at our stand (N2) at Art 45 Basel. 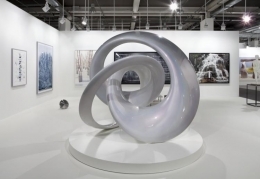 For more information on the fair, including directions and ticketing information, please visit the Art Basel website. For all inquiries on the gallery’s program and works to be exhibited at the fair, please contact Cecile Panzieri (cecile@skny.com) or Melissa Morales (melissa@skny.com) via email or at the gallery (212.239.1181). On the occasion of Art 45 Basel, curators Klaus Biesenbach and Hans Ulrich Obrist have invited 14 international artists, including Marina Abramović, Allora & Calzadilla, Ed Atkins, Dominique Gonzalez-Foerster, Damien Hirst, Joan Jonas, Laura Lima, Bruce Nauman, Otobong Nkanga, Roman Ondák, Yoko Ono, Tino Sehgal, Santiago Sierra, and Xu Zhen, to participate in 14 Rooms. This live art piece explore the relationship between space, time and physicality with an artwork whose “material” is the human being. Visitors will encounter a new situation within each of the 14 rooms, engaging in a diverse series of immersive and intimate experiences. Abramović's room will feature a reenactment of her 1997 seminal performance Luminosity. In the work being re-performed for 14 Rooms a performer sits on a bicycle seat bathed in light high up on the wall. Both physically and mentally demanding, Abramović explains, "It's really a work about loneliness, about pain and about spiritual elevation. About the luminosity and about the transcendental quality of the human being in general." The overall exhibition design by Herzog & de Meuron will serve as the interstitial structure tying the separate rooms together. 14 Rooms is a collaboration between Foundation Beyeler, Art Basel and Theater Basel. 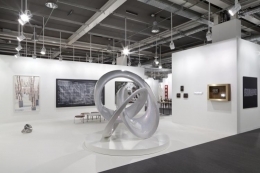 It will be staged in Hall 3 of Messe Basel and opens to the public ahead of Art Basel on June 14, running through June 22, 2014. It can be viewed daily from 10am to 7pm, with the exception of Monday, June 16, when it will be open from 10am to 5pm. For more information and to purchase tickets please visit the 14 Rooms website.